Fuller’s are pleased to announce that we are teaming up with Prostate Cancer and brewing Wise Men; a brand new, hoppy golden cask ale. One in eight men is diagnosed with prostate cancer in their lifetime. This December, 900 families will lose a loved one to it. So our aim is to raise money for Prostate Cancer UK, and raise awareness. Wise Men has been developed here in Chiswick by Head Brewer George Young. It’s a hoppy beer with malty, tropical notes and a subtle hint of blueberries thanks to the American Mosaic hops we’ve brewed it with. 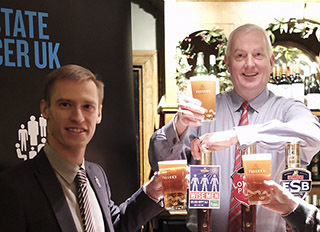 For every pint of Wise Men sold in a Fuller’s managed pub, 50p will be donated to Prostate Cancer UK, while every barrel sold to pubs and bars outside the Fuller’s family will raise £40 for this great cause. Currently, there are approximately 330,000 men living with prostate cancer, while 83% of men at an increased risk are not aware that they’re at risk. Join us in helping bring an end to that by raising a glass of Wise Men this winter. For more information, visit Prostate Cancer UK’s website.